The winner of NTIDâ€™s Next Big Idea student entrepreneurship competition was the team representing Small World That, a website and app that connects the international deaf community through a central hub. 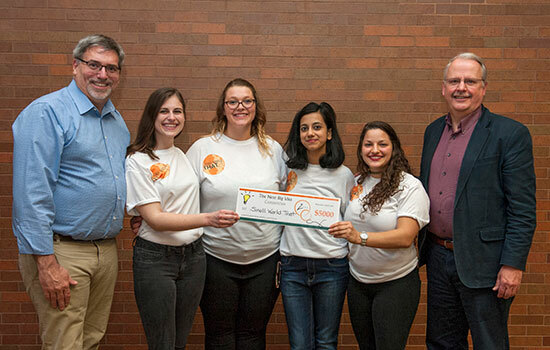 Pictured, from left to right, are Chris Wagner, chief operating officer, ZVRS; team members Lauren Putz, Sarah Stanislow, Priyanka Patil and Rachel Soudakoff; and Gary Behm, director of NTIDâ€™s Center on Access Technology. Five teams of deaf and hard-of-hearing students from Rochester Institute of Technology’s National Technical Institute for the Deaf went head-to-head April 25 during The Next Big Idea Competition, a Shark Tank-style business competition. Small World That, a central hub that connects the international deaf community through a website and app, took home the $5,000 first prize. Second place: VeeTV (Andrew Cho, administrative support technology major from Hayward, Calif.; Vincent Venutolo, mobile application development major from Bensalem, Pa.; and Sami Williamson, political science major from Hampton Bays, N.Y.): VeeTV is a media and entertainment company specializing in delivering media content to the deaf community. By bringing sign language to mass media on a streaming platform, the company enables the deaf community around the globe to enjoy their favorite movies, television shows, music videos, social media videos and more. VeeTV took home the $3,000 second-place prize. Third place: BodyEasy (Tony Nguyen, industrial design major from Pennsauken, N.J.; John Huang, graduate business student from Brooklyn, N.Y.; and Evans Seraphin, applied computing major from Brooklyn, N.Y.): BodyEasy is a wearable assistive device that enables users to reduce the pressure on the back when lifting heavy objects. BodyEasy won the $2,000 third-place prize. Other finalists included Yovato, (Joseph Ruggieri, finance major from Hopewell, N.J., and Michael Wentland, mechanical engineering technology major from Lynnwood, Wash.) which hopes to revitalize the sports industry by preventing knee injuries, and ASL Ripple, (Emmanuel Perrodin-Njoku, biomedical sciences major from Washington, D.C.; Kaytlyn Johnson (Master of Architecture major from Fargo, N.D.; and Dara Levy, nutrition management major from Carmel, Ind. ), an American Sign Language consulting firm serving interpreting programs within universities and organizations that focus on providing ASL interpreting services. The Next Big Idea competition is an annual event where teams of students combine skills related to their individual majors to create innovative products, technology or businesses. Teams work with mentors on their projects and compete before judges for cash prizes. This year marks the seventh anniversary of the competition.